We meet again for the fourth installment of vintage Houston mashed with its present-day locations. 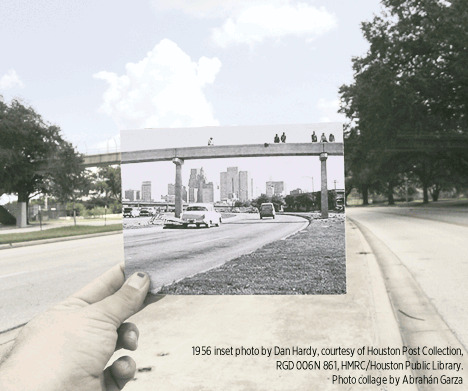 Here is another look at how much Houston has changed and how its deep-rooted history won't fade. One of the best examples of change is Main Street. Gone are the movie theaters of the 1920s and in are the northbound and southbound tracks used by the Metro Light Rail — reminiscent of times when trolleys dominated downtown travel. You can still hear the church bells ring every hour from the First United Methodist Church, located at 1320 Main at Clay. Boasting more than 100 on-tap brews, the Flying Saucer Draught Emporium, at the corner of Main and Capitol, still serves drinks at the same location that used to house one of the best soda fountains and candy counters in town when it was the S.H. Kress & Co.'s 5-10-25 Cent Store. Further down Main Street, Rice Stadium seems frozen in time since being built in 1950 on the campus of Rice University, a stopping place for John F. Kennedy's "We choose to go to the Moon" NASA speech as well as Super Bowl VIII in 1974. Another example of restoration is the original United States Post Office Building, located at 901 San Jacinto. It ships out new recruits and specialists on a daily basis as a Military Processing Center. The City Hall reflection pool at George and Martha Hermann Square park has its own urban legend: It has been said that according to George Hermann's will, people are allowed to sleep in the park. Honoring that wish, the city attorney's office stated in a 1987 article that police are not to arrest anyone sleeping in the park; however, the Parks Department says that people are not permitted to sleep there. Abrahán Garza is a native Houstonian and long-time Morrissey devotee. He spins and collects vinyl and has been with the Houston Press since 1999. Abrahán is pronounced AH-BRAN en Español.